The impulse behind painting a landscape — or photographing or drawing one — seems to be about looking at the world as it is. Artists set up their easels outdoors and gaze across snow-covered fields, into swiftly moving rivers, down roads that meander into the forest. Their subject seems to be the natural world. Nevertheless, such works, which are often unpopulated except for the lone observers who made the pictures, are often products of solitude and introspection. Landscapes embody moods more often than they document ecosystems. In the Western tradition, pure landscape paintings were rare before the 18th century and the rise of romanticism and its probing of individual consciousness and emotion. Artists gaze upon nature looking for something about themselves. And though landscapes can be wonderful to live with over time, their contemplative quality can often get lost in a museum setting and they end up looking dully decorative. “The Pennsylvania Landscape in Impressionism and Contemporary Art,” at Woodmere Art Museum through Jan. 27, is an intermittently successful attempt to connect the concerns of some of the region’s early-20th-century artists with those working today. It is, as Woodmere director William Valerio notes in the catalog, a mash-up show. It attempts to give new energy to too-familiar sorts of paintings, most from Woodmere’s permanent collection, by pairing them with more recent works whose subject matter, composition, or technique echoes or contrasts with the previous works. It was organized by the curatorial team at the Woodmere as an honor to Brian H. Peterson, longtime chief curator at the Michener Museum, and also an artist whose video Seeing Chopin: Odyssey is one of the exhibition’s high points. Despite the title, not all the works show Pennsylvania scenes. Ireland, France, New Jersey, and a bunch of other places appear, in old works and new. And some of the works, especially those with urban scenes and plenty of people in them, aren’t really landscapes at all. The impressionism alluded to in the title is, of course, Pennsylvania impressionism, a phenomenon that coincided with the emergence of America’s now dominant suburban landscape, a phenomenon of which Woodmere and its Chestnut Hill neighborhood are a part. What these artists showed us was not what suburbia would become but the promise it first offered — to live a modern life in contact with nature. Peterson is one of the world’s experts on Pennsylvania impressionists, but perhaps the label has outlasted its usefulness. The real contribution this exhibition makes is to show them as individual artists with different talents and preoccupations, some of which are shared by artists working today. The show makes a strong case that artists from the region have been probing how we should see and live with our land for more than a century. William Langson Lathrop’s Twilight After the Storm (1900-05) shows, as its title suggests, a scene in which the sky is brightening even as night is approaching. 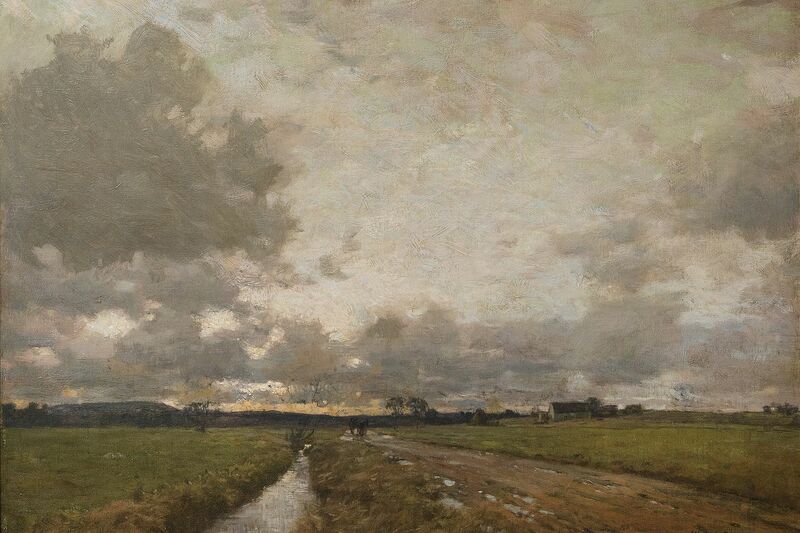 This distant agricultural scene has a low horizon line, so most of the canvas is dominated by a cloudy sky in which the painter suggests both the brightness that comes after the storm and the darkness that is coming because of the time of day. The photograph with which it is paired, Day into Night (2015) by Ron Tarver, also has a very low horizon line, so that most of what we see is a cloudscape. It does not seem as overloaded with emotion or ambiguity as the Lathrop. With his subtle and effective use of color, the painter is able to evoke a mixture of emotions, from elation to regret all at once. The photographer attempts something similar, but, in this case at least, paint is a far more expressive medium than photography. Another pairing consists of stereoscopic photographs of sites in Fairmount Park made during the 1870s by James Cremer, and the video Wissahickon Typologies (2018) by Peter Rose. Both deal in the illusion of three dimensions. You need to look through a stereoscope to see Cremer’s tourist shots, and to wear special glasses to see Rose’s view of Philadelphia, which includes the Mummers Parade and skateboarders along with the Wissahickon Creek, a waterway that figures in many of the works on display. In both the views and the video, people and places have a quality of ghostliness that seems inherent to 3-D depictions. Rose uses that quality as he layers imagery of different places atop one another and lets them slide past in diagonals across the screen. The imagery itself is clichéd but Rose’s technique makes it something to see and hear. Ying Li’s In Between Small Trees 2 (undated) has the title of a landscape, though it appears to be a pure, abstract gesture. It is a small work, about a foot square, that appears to have been painted with a brush almost as wide as the canvas. Both Raymond Theel’s Interior of Woods, from the late 1930s or early 1940s, and Emily Brown’s Winter Beech (2018) show trees, though their technique, composition, and approach could hardly be more different. Theel lays his paint on thick, in many colors, and he shows the trees’ trunks and the gnarly vines around them — but not the tree crowns. The painting is about texture. It has a tweedy expressionism to it. Brown’s drawing is an ink wash, so the surface is thin and monochromatic. She ignores the trunks and shows only branches. And though other works nearby use white paint to depict snow, Brown uses the white of the paper itself to suggest the snow on the limbs. Theel’s work communicates massive rootedness. Brown’s airier picture is about line and delicacy. I’d be happy to spend a few years living with either one, seeing what new lessons they offer over time. Through Jan. 27 at Woodmere Art Museum, 9201 Germantown Ave., $7-$10 (children and students free), free to all on Sundays, closed Mondays and New Year’s Day. Information: 215-247-0476 or woodmereartmuseum.org.